How the low-cost and abundant industrial chemical chlorodifluoromethane (ClCF2H) be used as a difluoromethylating reagent. Direct transformation and application of fluorinated industrial raw materials to organic molecules has always been one of our major goals since the establishment of our group, Zhang’s group, in 2008. ClCF2H, an inexpensive chemical used for production of fluorinated polymers, has drawn our attention ever since because it is an ideal and straightforward difluoromethylating regent. In 2017, we were thrilled to make a breakthrough in the activation of ClCF2H, in which a palladium-catalyzed difluoromethylation of arylborons with ClCH2H was achieved via a difluorocarbene pathway, representing the first example of catalytic difluoromethylations from ClCF2H. This reaction proceeded under mild reaction with remarkably broad substrate scope, which inspired us to further investigate a more cost-efficient process that can be developed by using abundant and sustainable first-row transition-metal as a catalyst and more widely available aryl halides as a coupling partner. We believe that this new process will have more applications in organic synthesis and the related chemistry. Accordingly, Dr. Wenhao Guo began this investigation by employing a nickel-catalyzed reductive cross-coupling. He selected aryl chloride as a coupling partner for its cheapness and ready availability to expand the utility of ClCF2H in organic synthesis. Although important progresses of the nickel-catalyzed cross-electrophile couplings have been made by Prof. Daniel Weix and Prof. Hegui Gong, the adoption of same strategy in the synthesis of fluoroalkylated compounds has never been reported due to the difficulties in selectively controlling the catalytic cycle to suppress the side reactions, such as hydrodehalogenation and dimerization of fluoroalkyl halides. Nevertheless, after a systematic reaction conditions screening, the desired product difluoromethylated arene was indeed generated by this new process. The ligand 4,4-diNH2-Bpy and the additive MgCl2 played a critical role in promotion of the reaction. However, only 30% or so yield of difluoromethylated product was obtained. Inspired by our previous work on nickel-catalyzed fluoroalkylations of arylboronic acids with DMAP as a co-ligand, he adjusted his strategy and found that DMAP could also benefit the current reaction and provide the difluoromethylated arene up to 76% yield. Meanwhile, the aryl iodide and aryl bromide were also proved to be applicable in the reaction. Unfortunately, we suffered from the poor repeatability and limited substrate scope of these reaction conditions. Then Mr. Chang Xu, Miss Xu He and Xueying Zhang carried out comprehensive work to examine the substrate scope but all failed. We got stuck and fell into the ‘dark days’. Endless control and screening experiments were conducted to identify the critical factors for the reaction efficiency and repeatability. During this hard time, Dr. Guo received his Ph.D and left our group with regret. But we still believe that there is always light in the dark. On the way of our difficult progress, Mr. Chang Xu finally found that the ratio between nickel and ligand is crucial to the reaction, in which the use of excessive NiCl2 vs 4,4-diNH2-Bpy could provide the difluoromethylated arene with good yield and repeatability. These uncommon optimal reaction conditions enable difluoromethylation of a wide range of aryl chlorides including many commercially available pharmaceuticals with high efficiency and excellent functional group tolerance. Encouraged by these results, Mr. Xu also conducted five 10-g scale reactions to demonstrate the scalability and practicability of the reaction. He found that even decreasing the loading amount of ClCF2H to 2.0 equiv could still provide the desired product without loss of the reaction efficiency. These exciting results make us believe that the current nickel-catalyzed process will have widespread applications in medicinal chemistry and materials science. Moreover, Mr. Xu conducted many experiments to gain some mechanistic insights into the reaction. 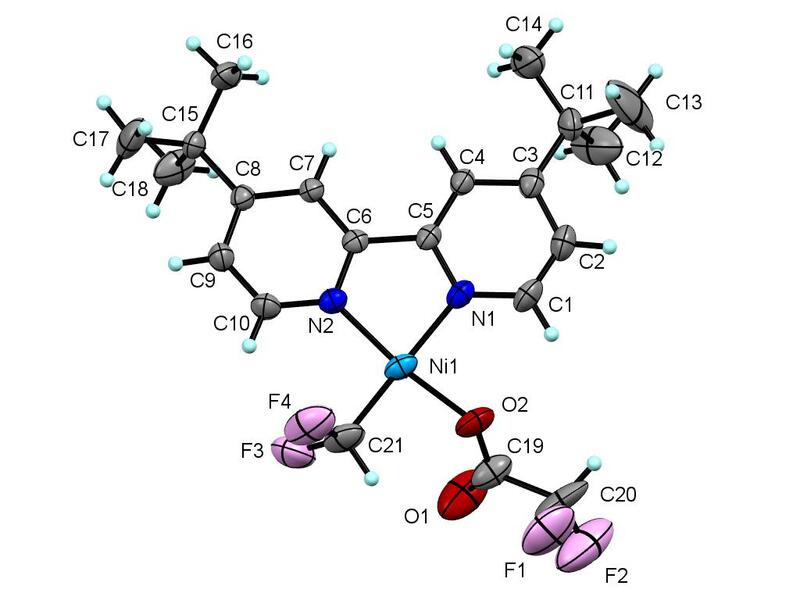 After several months’ efforts, he got the X-ray crystal structure of a difluoromethyl nickel complex Cl, which is the key intermediate for the following mechanistic studies. 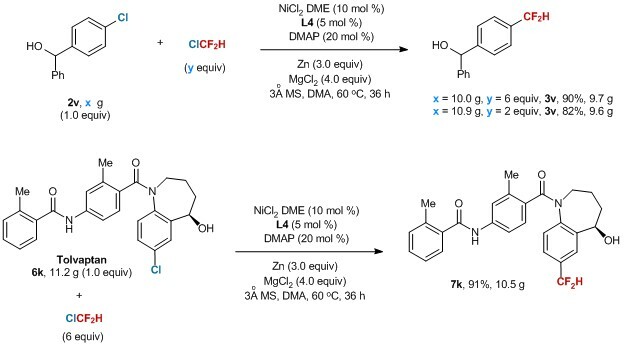 In sharp contrast to the previous difluorocarbene pathway, a novel difluoromethyl radical is involved in the current nickel-catalyzed process, which paves a new way for application of ClCF2H in organic synthesis. It is real exciting for all of us to achieve such a success in chemistry with strong will, hard work and good collaborations. Where there is a will, there is a way. We believe this is just the starting point of our group for a more challenging journey toward the exploration of infinite possibilities of Chemistry.